Applied Processor and Measurement, Inc. has been producing PWM Controllers (also known as PWM Drivers or PWM Solenoid Drivers) for automotive and industrial applications for nearly 20 years. Please use the comparison tables below to select the controller for your application. The Model 205 benchtop style PWM Controller is for general purpose solenoid design, development and drive applications, providing the highest level of functionality and accuracy. 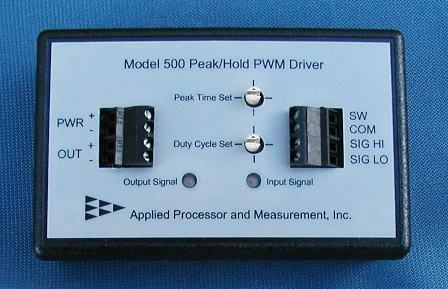 The Model 400 PWM Driver / Controller is a signal conditioner style PWM Controller featuring analog to PWM solenoid control, designed for PLC or computer control applications. 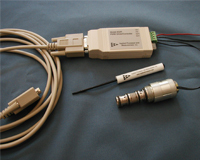 The Model 402 PWM Driver / Controller is a serial port dongle style PWM Controller featuring RS232 control of the PWM output, designed for computer control, embedded controller, and PLC applications. 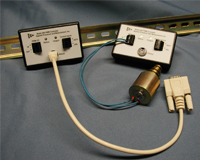 The Model 500 Peak and Hold (also known as Pick and Hold) Driver is designed to drive solenoid devices with an initial full-on pull-in pulse, then provide a reduced power hold-in current by pulse width modulating the output. The high frequency PWM output provides enough hold-in for the solenoid, while the current reduction saves overall power and reduces solenoid heat, thereby extending coil life. The Model 500 readily interfaces to PLC and computer controls in industrial applications. Our PWM Control / Drive products are designed using highly integrated microcomputer based circuitry. Software and hardware designed to your exacting specifications may be provided at a very reasonable cost. APM, Inc. is also able to modify or re-package an existing design for use in a production application. We welcome you to attach your specifications to an e-mail using the link below, or call and discuss your application with one of our engineers. In addition to the PWM Controller product line, we offer complete engineering design services for embedded control based solutions. 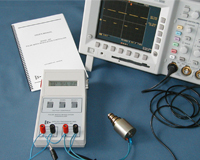 Please refer to our Electronic Engineering Design Services web page for further information.